An all new stage version of Willy Wonka is coming out. And Pioneer Theatre Guild (PTG) will be among the first theater companies in the world to perform it! Last week I shot press-release photographs for the show. Even before I got to the shoot, I knew the kids would be very entertaining. It’s not like this is becoming old-hat, but this is my 5th time taking publicity shots for a PTG production. By now, I’m quite familiar with the kids’ talent. I figure we’ll have loads of fun staging the shots, and we’ll get an excellent finished result. Yadda yadda yadda. But let’s get real. It’s not like these kids are gonna supplant the original — archetypal, canonical — film cast for me. That movie came out when I was 6, and it’s been etched fondly in my psyche ever since. 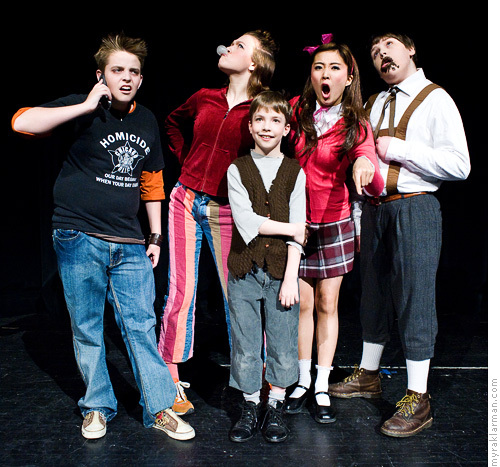 The four naughty children (clockwise from upper-left): Veruca Salt (Ashley Park), Augustus Gloop (Kiel Lerch), Violet Beauregarde (Clare Eisentrout), and Mike Teavee (Schuyler Robinson). The four naughty children with Charlie Bucket (Milo Tucker-Meyer). Now any regular reader of Relish (or friend of mine, or friend of the PTG) can already predict how this blog entry is going to end, right? That I am going to attest to being completely transported to Wonka’s factory by the kids’ acting alone (without any stage design or music — none of which is ready yet). That I’ll describe in detail just how brilliant the performers were (and wax poetic about the costumes and make-up). That I’ll do absolutely nothing to defuse suspicions that I’m simply a devoted fan who is smitten with everything that the Guild does (if not an out-and-out shill). And finally, that I’ll wrap up by emphatically urging everyone to do whatever it takes to get to the show. So? Just because you guessed exactly what I was going to do — does that make it any less true? I should think not. What’s also self-evidently true is that I’m running out of novel ways of saying these productions rock! 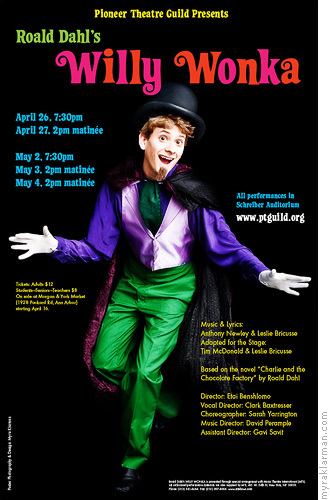 This show has me so excited, I jumped at the chance to reshoot Willy Wonka (Max Rasmussen) for the poster. Myra you are a gift to the universe!!!! And I am running out of new ways to thank you, Myra. You are quite amazing. Thank you for such effusive feedback — I’ll try not to let it go to my head! I really do love working with these kids. That is so cool! I just watched the remake of the original movie and it was so, so, so awful. They ruined my girl, Veruca. Nice to see you briefly today and meet some of the Fam! Sorry I didn’t make it to Sweetwaters (see post over on Flickr). ‘can’t believe these are who I think they are….‘can’t wait to see them live on stage…amazingly angled shots. and afterwards will u put a youtube video of the show – i really wanna watch it! !